NORTHAMPTON — A tall, lanky 15-year-old approaches a hurdle made of rope strung between plastic cones. An athlete at a Special Olympics track and field event, he is guided by an aide to step over one hurdle after another. Cheers of “We got it!” and “Yes!” come from watching teachers, peers and parents, as the boy, Aaron “AJ” Strack, starts toward the final hurdles. His foot catches on one, but the crowd only gets louder. He steps over the last hurdle, and then comes what Gino Roman, Strack’s teacher at Northampton High School, said is Strack’s favorite part: the applause. “Take a bow, AJ!” someone shouts. He smiles and bends forward as the crowd claps. 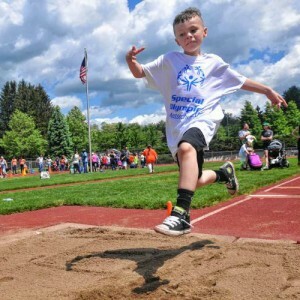 Strack and nearly 100 other students from area schools enjoyed cheers and encouragement Thursday as they participated in track and field events at Northampton High School for the Special Olympics Massachusetts School Day Games.